The Lybia crab is a species of small crab in the family Xanthidae. It is also referred to as Hawaiian boxer crab, pom-pom crab, cheerleader crab, mosaic boxer crab among many other nicknames. The crabs are known for their signature move of always carrying a small living sea anemone around in each of its claws, which helps them catch food and protect themselves from predators (thought to resemble pom-poms or boxing gloves). These tiny treasures can be hard to find, but if you keep your eye out, even on night dives, you might be lucky enough to spot one. 1. 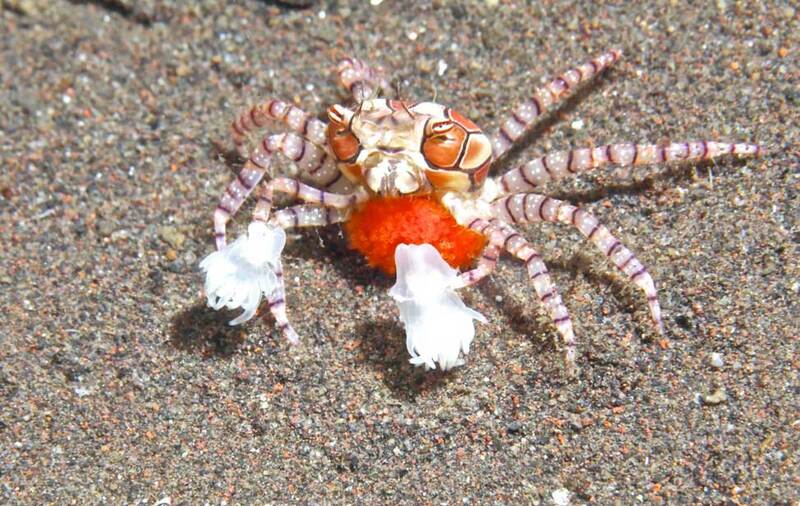 Boxing Gloves: If provoked or attacked by a predator, the pom-pom crab (boxing crab) will threaten the aggressor and try to deter it by waving it’s anemones around, the tentacles of which are well armed with cnidocytes (stinging cells). 2. Mothering Skills: The red eggs of pom-pom crab are carried around on the female’s abdomen for around 13-15 days where they are brooded. 3. Tight Grip: Pom-pom crabs have been known to use three different species of anemones. Sometimes substituting other organisms such as sponges and corals for the sea anemones. 4. 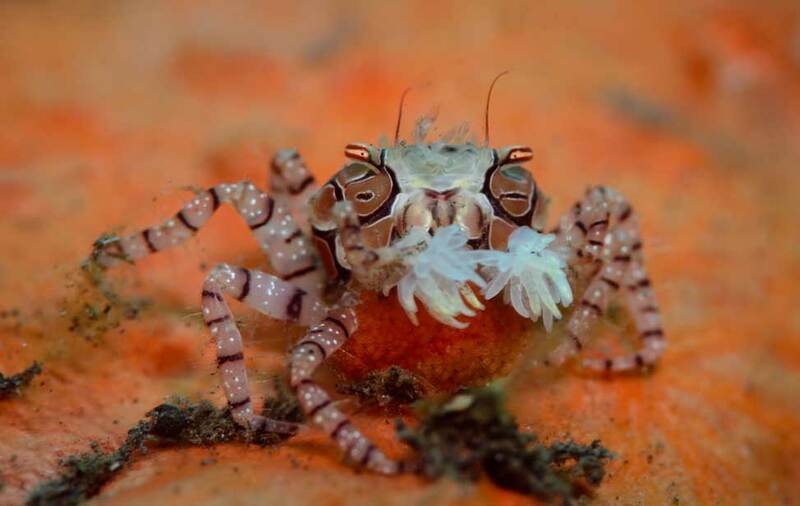 Best Friends: The relationship the pom-pom crab has with the sea anemone – being carried in it’s claws – is not essential for the survival of either species. 5. 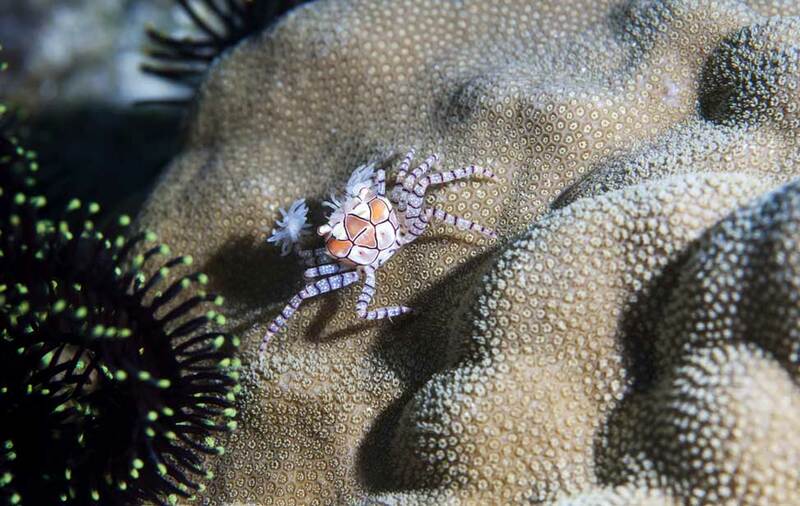 Tiny Cheerleader: You’ll have to peer into little crevices to try and spot the pom-pom crab which grows to an average width of about 2.5 cm (about 1 in). 6. Tropical Travels: Pom-pom crabs (Lybia tessellata) can be found in shallow water in the tropical Indo-Pacific region, its range extending from the Red Sea and the East African coast to Indonesia and New Guinea. 7. Hawaiian Flower: Also referred to as the Hawaiian boxer crab (Lybia edmondsoni) is endemic to the Hawaiian Islands. It’s Hawaiian name is kūmimi pua, meaning “inedible flower crab”. 8. Professional Cleaner: The sea anemone’s tentacles can be used like mops, gathering debris and food particles from the ground around the crab’s hiding place.